The subject of this post may fall within the category of quaint historical trivia. But I have long found the anecdote intriguing and when I mention it to others, even historian friends, I find that it is little known. The last spot on English soil that the “Pilgrims” touched before departing aboard the Mayflower was Plymouth, England. They were forced to put into that port and never intended to be there. The place where they chose to settle shortly after their arrival in the New World was Plymouth, New England. The harbor had already been given that name. And they never intended to settle there. So, by strange coincidence, the Pilgrims went from Plymouth to Plymouth–two places they never meant to be. Fortunately, Smith had yet another back-up plan, savvy explorer and businessman that he was. His men set to work trading with the Natives for furs and fishing for cod. This turned out to be successful and highly profitable. 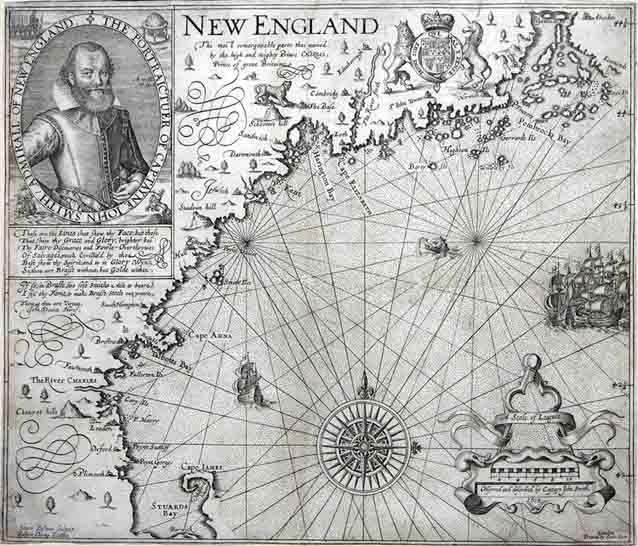 While his crews were thus employed, Smith himself skirted the shore of New England with a few men in a small boat, sketching out a map of New England from Cape Cod to Penobscot Bay which he published in his 1616 book. After Smith presented his map to King James, a teenage Prince Charles was given leave to rename many of the locations for the version to be published. Rivers, mountains, islands, capes and Native settlements received English names. This is somewhat confusing in the case of Native settlements which are depicted on Smith’s map as though they were existing English towns with English names such as “London,” “Oxford,” and “Plimouth.” In fact there were no permanent English settlements at the time of Smith’s exploration, despite how it may appear on the map at first glance. A few of Prince Charles’s names have stuck. Among them Cape Ann, the Charles River and…Plymouth. Six years after Smith’s exploration, the Pilgrims set out for the New World. A good portion of the Separatist congregation that had been living in exile in Holland boarded a small vessel, the Speedwell, in Delfshaven and sailed to England. There they met up with another vessel, the Mayflower, in Southampton. Aboard the Mayflower were more members of the Separatist congregation who had been in England as well as a good number of “Strangers”–men and women who had signed on to the venture seeking a brighter future and not necessarily concerned with religious matters. The two ships were to sail together to the northern part of Virginia Colony. At that time, Virginia Colony included lands as far north as Hudson’s River. The Pilgrims, confined by the terms of their patent to settle within Virginia, intended to settle as far from Jamestown as they could so as to govern themselves and worship as they pleased with minimal interference. And so, if all had gone according to plan, the Pilgrims would have settled at the present day site of New York City. But very little about the voyage went according to plan. Shortly after setting out from Southampton, the Speedwell began to leak at an alarming rate. The two ships were forced to put in to Dartmouth so that repairs could be made on the smaller ship. Further time was lost because the winds would not cooperate. The passengers were forbidden from leaving the ships for fear that they would abandon the venture. Before they had even left England, a large amount of their provisions had been consumed. The two ships set out again in late August. But still the Speedwell leaked. About 200 miles out into the Atlantic, Master Christopher Jones, commanding the Mayflower, made the call and both ships turned around, this time taking refuge in Plymouth, Devonshire. The Pilgrims would later learn that the master of the Speedwell, a man named Reynolds, had no intention of making the voyage to America and purposely overburdened his masts with canvas, causing the ship to leak. In Plymouth, the agonizing decision was made to continue on with one ship, the Mayflower alone. A good many of the Speedwell passengers were packed onto the Mayflower. But a number of them were forced to remain in England. It must have been a sad and bitter parting. Some of the Leiden congregation who were on the Speedwell would never make it to New England. On September 16, 1620 (New Style), the Mayflower left Plymouth–a place they had never meant to visit. Two months and a few days later, they sighted land off of Cape Cod. Master Jones made an effort to continue on to Hudson’s River, but numerous factors conspired against him–weather, lack of knowledge of the dangerous shoals around Cape Cod, and most importantly the fact that provisions were running dangerously low. The Pilgrims would have to settle somewhere in the vicinity of Cape Cod, though they had no permission from the Crown to do so. After reconnoitering on foot and by boat around the Cape, the Pilgrim exploring party eventually blew in to Plymouth Harbor on December 19. There is some disagreement as to whether or not they had the benefit of Captain Smith’s map. The fact that they called the place Plymouth, as the harbor was named on Smith’s map, would suggest they possessed a copy. However, as historian Nathaniel Philbrick pointed out in his history of Plymouth Colony, “If the Pilgrims did possess Smith’s map of New England, they failed to make good use of it.” They spent a great deal of time mucking about Cape Cod looking in vain for a good harbor, either ignoring or ignorant of the fact that Smith’s map located a number of excellent sites for potential settlement, most prominently the Charles River and what is now Boston. But little about the voyage had gone logically. Mishaps and chance led them from Plymouth to Plymouth.